Acute kidney injury (AKI) is a frequent complication in ST-elevation myocardial infarction (STEMI) patients. Factors other than contrast exposure have been suggested as major contributors to renal dysfunction in patients undergoing primary percutaneous coronary intervention (PPCI). Our aim was to assess the incidence and risk factors of AKI in high-risk STEMI patients, mostly treated by PPCI with implemented measures to prevent contrast-induced AKI. We retrospectively analyzed data of 245 STEMI patients (165 men, mean age 63.9 ± 11.9 years) admitted to the Department of Medical Intensive Care Unit. Demographic, clinical, and mortality data were compared between AKI and non-AKI group. AKI was defined as a 1.5-fold increase in serum creatinine from baseline level within 24–48 hours. AKI developed in 34/245 (13.9%) patients. PPCI was performed in 226/245 (92.2%) of all STEMI cases, with no difference between AKI and non-AKI group. There were significant differences between AKI and non-AKI group in diabetes mellitus (41.2% vs. 20.9%), prior MI (26.5% vs. 11.8%), prior resuscitation (38.2% vs. 12.4%), admission acute heart failure [AHF] (44.1% vs. 12.8%), in-hospital AHF (70.6% vs. 17.5%), and hospital-acquired infection [HAI] (79.4% vs. 18.0%). Significantly more AKI patients had increased admission CRP ≥25 mg/L (38.2% vs. 11.8%), peak CRP ≥50 mg/L (91.2% vs. 36%), admission troponin I ≥10 mg/L (44.1% vs. 24.6%), peak troponin I ≥50 mg/L (64.7% vs. 44.1%), peak NT-proBNP ≥400 pmol/L (82.4% vs. 27.5%), and ejection fraction <45% (76.5% vs. 33.6%). 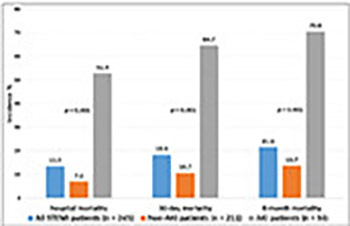 Mortality was significantly increased in AKI group, including in-hospital (52.9% vs. 7.1%), 30-day (64.7% vs. 10.7%) and 6-month mortality (70.6% vs. 13.7%). Significant independent predictors of AKI were prior resuscitation (OR 4.171, 95% CI 1.088–15.998), HAI (OR 7.974, 95% CI 1.992–31.912), and peak NT-proBNP (OR 21.261, 95% CI 2.357–191.795). To reduce the risk of AKI in STEMI patients, early diagnosis and treatment of AHF and HAIs are advisable.